I always enjoyed pulling weeds in my lawn – to a point. Now I enjoy the job much more. 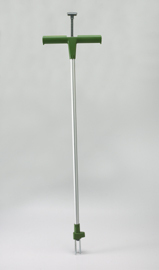 This Scandanavian designed weed extractor not only saves back ache and green stains on my knees, it pulls dandelions – and other common weeds – better than I can with a traditional weed puller. Truth is, this weeder removes more of the root and aerates the soil in my lawn at the same time. It’s easy, effective and an environmental alternative to chemical weed killers. And it’s fun to use. Really.